"The world's leading synthetic motor oil brand, Mobil 1 is an advanced full synthetic motor oil family that provides performance beyond conventional motor oils. Mobil 1 motor oils meet or exceed the toughest standards of Japanese, European and U.S. car builders and provides exceptional protection against engine wear, under normal or even extreme conditions." Outstanding wear protection and engine cleanliness. Excellent high- and low-temperature performance. -40ºF and protects at oil temperatures as high as 500ºF. Excellent fuel economy (specific grades/viscosities). "You've never seen an oil like this before. Mobil 1 Extended Performance is a high-performance synthetic motor oil that keeps your engine running like new and provides protection for up to 15,000 miles between oil changes. This advanced full synthetic formulation helps extend engine life, reduce oil breakdown and minimize engine wear." Performance and guaranteed protection for up to 15,000 miles. Proprietary advanced full synthetic formulation that helps extend engine life. Suitable for cars, vans and light trucks. "Mobil 1 High Mileage motor oils are recommended for vehicles with more than 75,000 miles including all types of modern gasoline engines found in passenger cars, SUVs, light vans and trucks. Mobil 1 High Mileage motor oils are suitable for many types of severe driving applications including high-speed highway and stop-and-go city driving. It is not recommended for two-cycle or aviation engines, unless specifically approved by the manufacturer." 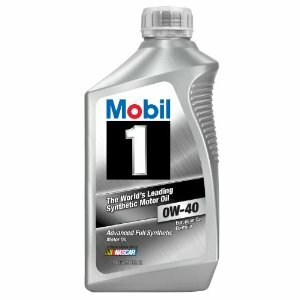 Like Mobil 1 automotive products, the two Mobil 1 motorcycle oils are based on proven, advanced synthetic oil technology. These unique, fully synthetic motorcycle oils are scientifically engineered to withstand the extreme heat produced by high-revving motorcycle engines and the toughest riding conditions. These formulations are designed specifically for the unique needs of motorcycles. Enhanced lubrication for maximum horsepower. Excellent protection at peak engine RPM. Excellent transmission performance (in 10W-40/20W-50 grades). "Mobil 1 ESP Formula synthetic motor oil is made with a proprietary blend of leading edge components formulated to be fully compatible with the latest Diesel Particulate Filters (DPF's) and Gasoline Catalytic Converters (CAT's). Mobil 1 ESP Formula is recommended for all types of modern automobile engines, especially the high-performance gasoline and diesel engines found in the latest passenger cars, SUVs and light vans. Mobil 1 ESP Formula is especially suitable for extreme conditions, where conventional oil often may not perform. It is not recommended for 2-cycle or aviation engines, unless specifically approved by the manufacturer." Outperforms conventional ATF and meets General Motors' Dexron® III and Ford's Mercon® and Mercon® V requirements. Also recommended for Chrysler automatic transmissions. Fully synthetic formula provides outstanding resistance to oil breakdown and deposits under severe duty and high temperatures. Mobil 1 Synthetic ATF is designed to meet the demanding requirements of modern passenger vehicles. The synthetic base oil composition enables excellent performance even in the severest of operating conditions. It offers outstanding gear shifting and power transfer performance. Versus conventional ATF fluids, the inherently high viscosity index and stability of Mobil 1 Synthetic ATF protects against thermal breakdown at high operating temperatures, while still providing outstanding performance at very low ambient temperatures. Mobil 1 Synthetic ATF combines high-performance synthetic hydrocarbon base oils and a superior balanced additive system to provide significantly higher levels of performance above conventional fluids. This unique, advanced technology has demonstrated long drain capability, excellent friction retention, and low-temperature capability. Further, it helps to improve overall transmission durability and cleanliness. Automatic transmissions should be checked for proper fluid levels at regular intervals, and the fluid should be changed at manufacturer-recommended intervals. However, this may vary due to your vehicle's operating conditions. Some manufacturers recommend more frequent changes of transmission fluid under severe driving conditions, such as heavy traffic, hot weather and trailer pulling". All Mobil trademarks & copyright material belongs to Mobil (USA). The manufacturer of Mobil oils.